The elements in which the extra electron, additionally called the differentiating electron enters the (n-2) f orbitals are called as "f" block elements. Since the extra electron goes to (n-2) f-orbitals, these elements have been given the name f-block elements. Since (n-2) f orbitals lie similarly profound inside the piece, (being the inner penultimate shell), these elements are called "Inner transition elements". The elements with nuclear numbers 89-103, in which the 5f orbitals are being filled, constitute the actinides series. Similarly as in the lanthanides, where the counter penultimate 4f orbital is filled progressively by the expansion of one electron at once, in actinides the counter penultimate 5f orbital is progressively filled by the expansion of one electron at every progression. In this way, lanthanides constitute the principal inner transition series and the actinides constitute the second inner transition series. In compundsof 5f-block elements the extra electron enters the 5f-orbital. The elements of this series are likewise called as actinides or actinones, since these elements come after actinium, Ac (Z= 89) in the periodic table and show close similitudes with Ac. Important: Although, the fourteen elements from Thorium (Th-90) to Lawrencium (Lw-103) are called Actinides, because of the similitudes in properties among the 15 elements, from Ac - 89 to Lw-103, all these 15 elements are thought to be individuals from the actinides series. Along these lines, Ac-89 is likewise concentrated under actinides. The actinides comprise of the second inner transition series. With the exception of Ac, Th , Pa and U, which happen in nature in Uranium minerals, all the rest of the actinides are unstable and made synthetically by atomic transmutations. The actinides elements lying past Uranium, are called trans-uranium or trans-Uranic elements.All the actinides are radioactive. Electronic Configuration: Every one of the actinides has regular 7s2 configuration and variable inhabitance of 5f and 6d sub shells. The general electronic configuration of actinium is [Rn] 5f0-146d0-2 7s2 where Rn is the electronic configuration of the element Radium. The inconsistencies in the electronic configuration are identified with the stabilities of half filled or full filled orbitals (f0, f7, f14). 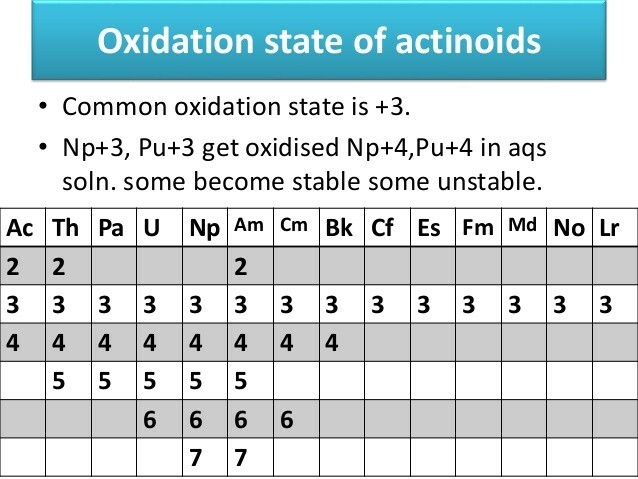 Oxidation States: Not at all like lanthanides, actinides demonstrate an assortment of oxidation states from +3 to +6 because of the little energy gap between 5f, 6d, and 7s sub shells. The chief oxidation states are +3 and +4. The +3 oxidation state is the most stable. The +4 oxidation state is the most stable in Th and Pu. +5 in Pa and Np and +6 is found in U. In actinides, the disseminations of oxidation states are uneven. Complex Formation: The level of complex formation diminishes in the order M4+> MO22+> MO2+ where M is an element of the actinide series. There is a high centralization of charge on the metal molecule. Melting and Boiling Point: Although actinides do not show any regular trend with increasing atomic number, they have high melting and boiling points like lanthanides but do not demonstrate. Density: All actinides have high densities with an exception of thorium and amercium. Electropositive Character: As lanthanides, actinides also have high electro positivity. Ionization Enthalpies: As compared to lanthanides, actinides have lower ionization enthalpies because there is more effective shielding of 5f than 4f from nuclear charge. Magnetic Behavior: Depending on the presence of unpaired electrons all actinides are paramagnetic in nature. Radioactivity: All actinides are radioactive in nature. Initial couple of individuals have moderately long half lives yet the remaining have half-lives from a couple days to a couple of minutes. Color of the Ions: Actinides particles are for the most part colored because of f – f transitions. It relies on the number of electrons in 5f orbitals. Chemical behavior: They are profoundly reactive metals in fine state and a strong reducing agent. A couple of properties are given underneath. They react with boiling water to give oxide and hydride. They consolidate with a large portion of the non-metals at direct temperature. All these metals are attacked by HCl acid yet the impact of nitric acid is little. The size of molecules or M+3 particles diminishes frequently along the actinides series with increment in nuclear number from Th to Lr. 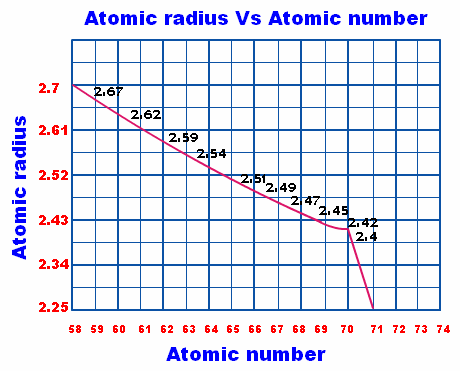 The enduring decrease in ionic radii with increment in nuclear number is alluded to as actinide contraction simply like lanthanide contraction. Important: The reason of this contraction is the poor shielding impact of a 5f electron by another in a similar shell which builds the effective atomic charge and subsequently withdrawal in size of the electron cloud. This is on account of 5f orbitals stretch out in space past 6s and 6p orbitals whereas, 4f orbitals are buried somewhere inside the molecule. Actinides lie in the 7th period (Incomplete period with n = 7) and III B group of the periodic table. Preceding the revelation of trans-Uranium elements, (Trans-uranium elements are the elements lying past Uranium in the periodic table), the actually happening heaviest known elements to be specific, Th-90, Pa-91, and U - 92 were set underneath Hf-72, Ta-73 and W-74 in IV B, V B and VI-B groups of the periodic table, in light of the fact that these elements demonstrated +4, +5 and +6 oxidation states and resembled Hf, Ta, and W individually in a number of their properties. The then unfamiliar trans-uranium elements with nuclear numbers 93 to 100 were along these lines anticipated that would possess the positions in the periodic table underneath Re-75, Os-76, Ir-77, Pt-78, and so forth. The revelation of Neptunium (Np - 93) came in 1940 and this disclosure was followed by the disclosure of Plutonium, Pu-94 in 1941. The tracer elements Np-93 and Pu - 96 demonstrated that the chemical properties of these two elements especially look like Uranium - 92 and not in any way those of Re-75 and Os-76. On this premise, all the three elements, U, Np, and Pu were put under W-74 in group VI B in a segment. Be that as it may, later, this was likewise demonstrated wrong since numerous different elements found did not take after this example. In 1944, Seaborg recommended that every one of the elements with a nuclear number more prominent than 89 constitute a moment series of inner transition elements, like the lanthanide series. In this way, they were put underneath the lanthanides and named as Actinides series. Thus, the actinides frame a second row beneath lanthanides and these two series are isolated and set underneath the fundamental periodic table. Thorium is utilized as a part of the type of oxide, ThO2 for making brilliant gas mantles. The mantle is produced using silk filaments, is dipped into a blended arrangement of thorium and cerium nitrates in the proportion of 99% and 1% separately. At the point when settled in the lamp and ignited, the silk filaments burn with extreme heat leaving a network of thoria (ThO2) and ceria(CeO2). The little amount of cerium oxide is essential on the grounds that, ThO2 itself gives just a poor light. Thorium salts are additionally utilized as a part of prescriptions in the treatment of cancer. Thorium is utilized as a part of the fabrication of fine bars for nuclear reactors. 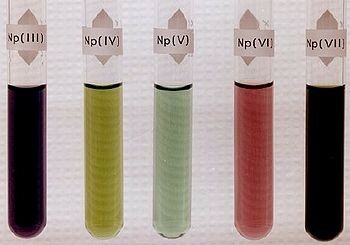 Uranium salts bestow green shading to glass. Uranium salts are utilized as a part of ceramic industry, textile industry and also in prescriptions. Uranium is utilized as a part of the generation of atomic energy by the procedure of atomic splitting. Plutonium is fissionable material and is utilized for fuelling nuclear reactors. It is utilized as an element of nuclear hazardous weapons. It can likewise be utilized to make molecule bombs. Q1. How many neutrons are in the most common version of krypton? Q2. How can a transition metal form an ion with a charge of 3? As you may see, they can frame particles by either losing or picking up electron in 4s orbital. In the science of the transition elements, the 4s orbital acts as the furthest, most noteworthy energy orbital. At the point when these metals frame particles, the 4s electrons are constantly lost to start with, prompting to a positive charge on particle. Increasing any electron in 4s orbital would diminish the stability of anion in this manner shaped. In this way, they frame just cations (positive particles). As a rule, the external electronic configuration of transition elements is n s2 (n−1) d1−10n s2 (n−1) d1−10. In light of reasons over, the electron expels from the ns ns orbital, where n = primary quantum number of molecule. See Zn2+ZnX2+ configuration: [Ar] (3d) 10[Ar] (3d) 10 for instance. The electron exits from 4s orbital, prompting to the arrangement of a decidedly charged particle.